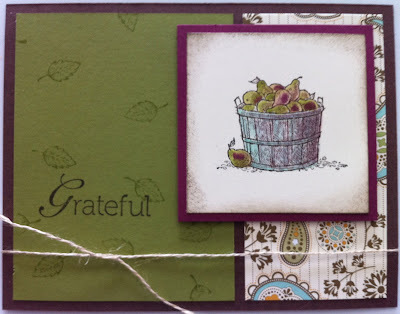 Now that I FINALLY have my computer back, I can show you this lovely card I made using the new Always Thankful set from the Holiday Mini Catalog. I also used the leaf from Lovely As a Tree to accent the Old Olive cardstock. It's so simple, yet looks elegant. Perfect to send out to family or friends you won't be able to see for Thanksgiving.